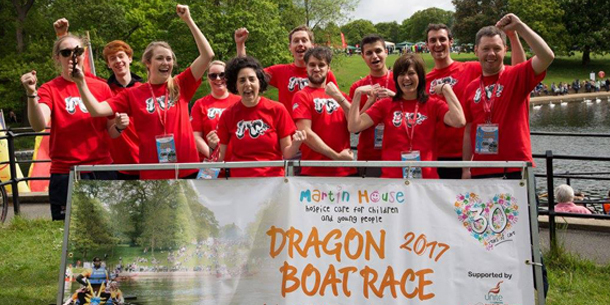 Staff from GWP Architecture and GWP Project Services took part in the annual Martin House Children’s HospiceDragon Boat Challenge 2017 held a stone throw from our Leeds Office at Roundhay Park. Each boat consists of 11 members including 10 paddles and a drummer sat at the front. Teams compete in three heats with the fastest progressing to the final; unfortunately we didn’t make it though this year but did enjoy a fun day in the sun. We had great support from friends and family throughout the day and want to thank the organisers for a flawless event. The date for next years challenge is Sunday 20th May 2018 – So we better start training! Head to Twitter for a video of the team in action.